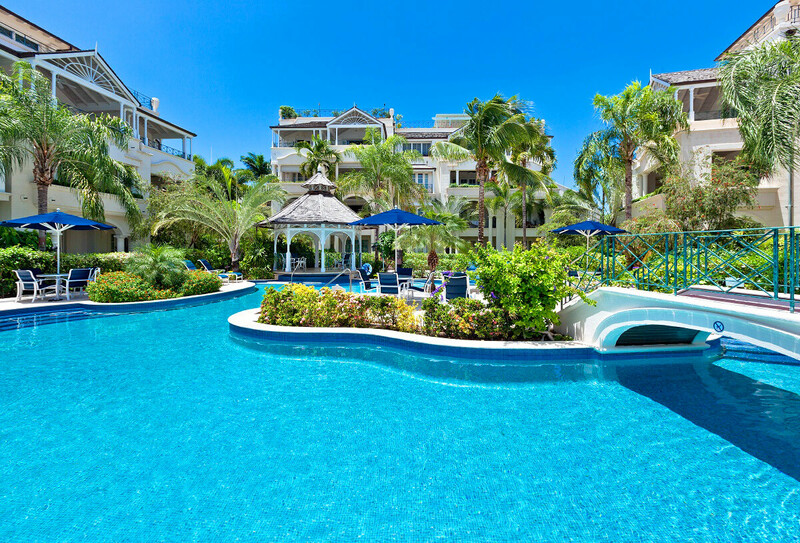 Located in a secure gated community, the amenities at Schooner Bay are limitless. Let us take care of everything from car rentals and airport transfers to groceries and locating a private chef. This three bedroom apartment is spread out over two levels allowing for part of the family to sleep in, while the rest of them go about their morning activities. The huge porch spans the entire property, making it perfect to sit outside and enjoy the ocean view. If you want to take a dip, there is a large, communal pool set amongst tropical landscape. There is nothing missing, so bring the family and visit this fabulous property just a short walk from Speightstown. This exclusive, luxurious 2 storey beachfront penthouse apartment is available for rent in this leading development. Laid out over 2 floors, offering 3,322 sq. ft. of luxury living space - this apartment offers the idyllic beachfront experience. The bathrooms include marble tiles throughout - in particular the master bathroom and the main guest bedroom include twin sinks, whirlpool bath and separate corner shower. All bedrooms include ensuite bathrooms, and central air conditioning. Sea views can be enjoyed from the covered terrace off the living room - and views of the communal pool and gardens, as well as attractive views to the East are also available. Being a low density building of only 4 floors, ceiling heights are higher than most new buildings on the West Coast, which adds to the luxury and exclusivity of this unique residence. The wide covered terrace - ideal for watching the sunset or dining in the warm tropical evenings spans the entire property, offering plenty of space for family and friends. The furnishings are exquisite and are included in the sale of this property. Schooner Bay is located on the edge of the up and coming Speightstown, which includes several coffee shops and elegant restaurants - there is also a police station, several banks, a large supermarket and boutiques stores. Speightstown is water front and is away from the main highway, reflecting the charm of Old Barbados. Peace and quiet - Privacy and Exclusivity. We stayed at Schooner Bay #306 for 10 days in March with 3 adults and one toddler. The pictures are accurate and the furniture and beds are very comfortable. The cleaning lady, Rose, was very nice and accommodating with our daughter’s nap time. The grounds are lovely and its an easy 5 minute walk to Speightstown for groceries, the fish market and any essentials. There are a couple good restaurants within walking distance, and you can walk down the beach to cobbler’s cove, but you’ll otherwise need a car or cab if you want to go out. It is definitely a quiet place, we never felt crowded around the pool or beach. The pool and grounds around it are very nice and well maintained each day. The ocean directly out front isn’t swimmable because of the reef, but a 3 minute walk gets you to lovely soft sand, and resident turtles to snorkel with. Some snorkel tours do come each day but they’re not intrusive at all, unlike at Paynes Bay where we’ve previously stayed. We rented a paddle board and were able to keep it by the pool hut, but had to carry it down the beach a bit to be able to enter the water. Overall, we enjoyed our stay at Schooner Bay and would definitely return to this complex. Andrew at wheretostay.com was really amazing at helping us secure this condo at the last minute and was readily available for help and advice.